Most drivers in Denver know that ball joints are an important part of the suspension system. Visualize a ball attached to a spindle, with the ball enclosed in a cup. This allows the joint to move in several directions, kind of like the way your hip works. Most vehicles have two or four ball joints on the front, depending on the type of suspension system. The joint allows the wheels to move up and down as the tires go over bumps, as well as allowing the wheels to turn as you steer. The ball joints are continuously working and are subject to normal wear. Most ball joints on modern vehicles are maintenance free, meaning they are sealed and cannot be lubricated. Once the lubricant breaks down or leaks out due to a broken seal, the ball joint will wear more quickly. You may hear a clicking or popping sound from a corner of the vehicle when turning and /or going over bumps as a ball joint is failing. Your steering may begin to feel sloppy or stiff, depending on how the joint is wearing. You may even feel vibration in the steering wheel at highway speeds. Unusual tire wear is also a sign of a problem. It’s important to replace worn ball joints BEFORE they fail. 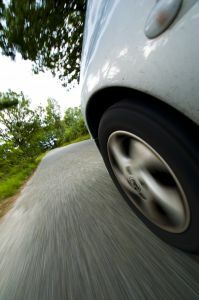 Once it fails, the joint may not be able to constrain the steering angle of a wheel, causing you to lose control. Your owner’s manual calls for periodic suspension system inspections. The ball joints are an important component that will be inspected for safe function. We can check to see if you are due for a suspension system inspection or ask you service adviser for an inspection if you are experiencing any of the signs of ball joint wear.